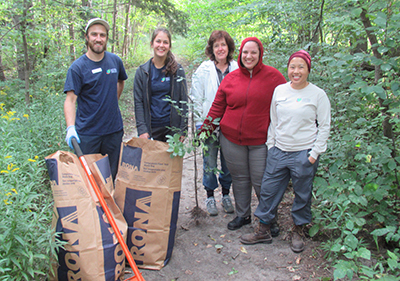 Credit Valley Conservation (CVC) has hosted an invasive plant removal event at Island Lake Conservation Area, helping to keep the natural area healthy for wildlife. The event took place last Saturday (Sept. 8) and saw CVC staff and volunteers comb the north end of the conservation area, removing invasive and unnatural plants that can introduce disease or cross-breed with native species and impact wildlife. “Plants that are not native to our area, they are causing determent to our ecosystem,” said Lorraine Chung of the CVC. Ms. Chung said the event, the third this year at Island Lake, has been going on for several years, this time targeting buckthorn and honeysuckle. Ms. Chung added that once the plants are removed it takes a few years to rehabilitate and grow natural plants. “While the large buckthorn plants are removed, we do still see young saplings coming out.” Some of the natural plants they establish include polar, pine, dogwood, and nannyberry.